So…. one night a couple of weeks ago, Steve and I were talking and I told him I dreamed of having my studio in our large front room. He asked why I didn’t go ahead and do it. “well”, I said, “many reasons: it would be pretty selfish of me to put my stuff in the best room in the house; we’re supposed to have a dining room for when people come; my studio tends to get really messy and the front room is the first thing people see when they come to the front door”. And that’s just to name a few reasons not to make our front room into my studio. He looked me in the eye as I talked and when I was done, he asked again, “why not go ahead and make it into your studio?” He said he would put a sign up on the front door that said “If you don’t like our mess, go away”.!!!! What did I ever do to deserve this man? The picture on top is what used to be the dining room. My sewing counter is the exact height I wanted and my sewing machine is dropped down to the perfect height – my husband is a genius! The counter is 10 feet long so it’s plenty big to wrangle a large quilt while quilting it. 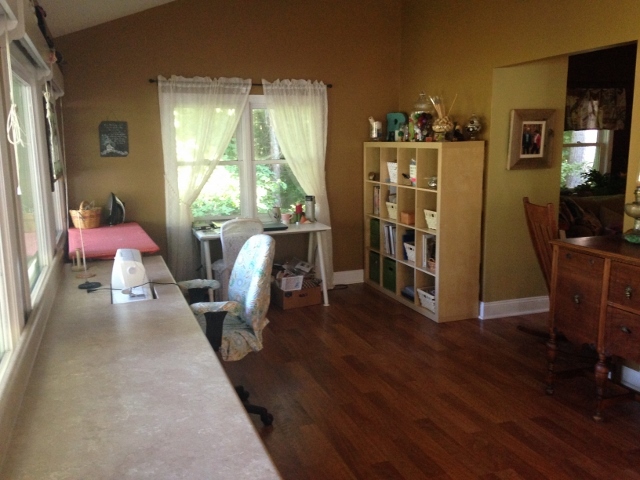 It’s hard to take good pictures of the windows, but there are 3 large 4 foot windows across the front of this room and my sewing machine is centered under the middle one. The small table under the far window is my desk. The second picture is what used to be the toy rom. There are still a couple of toys that are too large for any other space upstairs. I’m pondering moving them downstairs, but Kiyah is only 3 and too young to play down there by herself. The tall table is my cutting table! It’s the perfect height for cutting!! The longer table under the window is an extra space for a friend to come play with me or for me to spread out when I have more than one project going at a time. I am soooo thankful! Now to finish organizing the last of the studio stuff and turning that room into a dining room. Everyone I know thinks I’ve lost my mind because the dining room is downstairs. Honestly, we’ve only had company come to dinner a couple of times over the past year. I sew almost every day of my life. We can walk our plates down the stairs a few times a year in exchange for me having this lovely place to play! For my last birthday, I told the kids I wanted the gift of time. I want to spend time with them, that’s all. I don’t need another “thing” and if I really do have a need, I usually go out and buy whatever it is. This small glass bowl is my gift of time from Rachel. She found a Living Social deal and bought us a class from Art in the Dairy. We spent an evening playing with glass. I took a long slender piece of glass made by someone at the Dairy and I cut it up into small pieces and tried to create a woven effect. 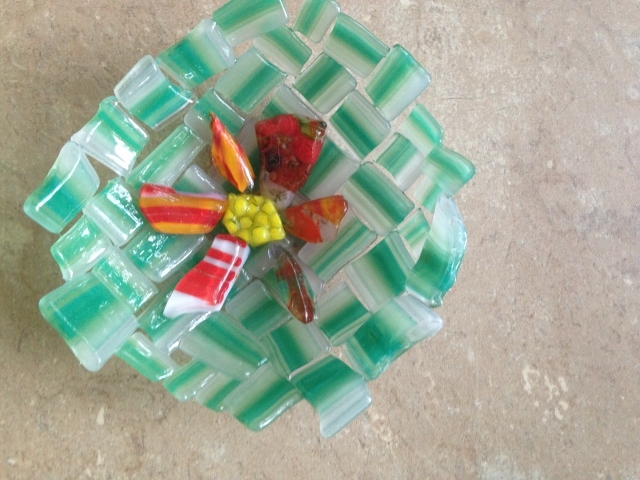 Then I took some odd pieces of red and yellow glass and made a flower in the center. I really wanted it to be offset, but the glass kept shifting around and wouldn’t stay put so the flower is in the center. We left our creations for about a week while they were fired in the kiln and then got to pick them up. I love this small happy dish. It’s only about 4 inches across, but it makes me happy and it reminds me of a lovely evening spent with Rachel! 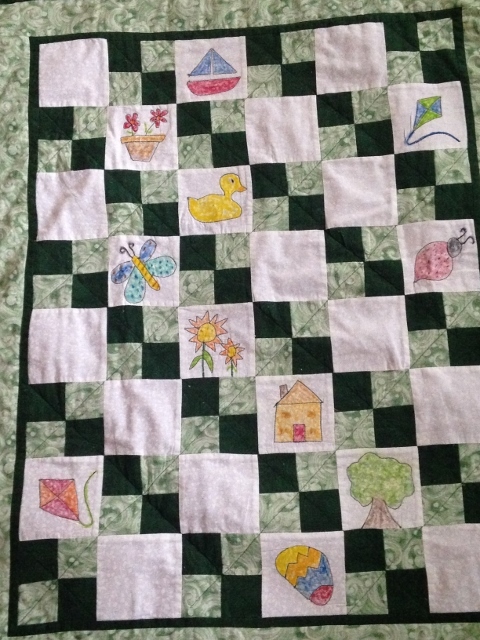 This is a small baby quilt I made years ago (maybe 15???) It was originally done with crayons in a workshop taught by a local gal. She promised that the crayons would be permanent, but after I washed it the first time, all I had was the quilted outline of the various designs I had drawn. I was so disappointed. Well, in the process of moving my studio, I ran across my Pentel Arts Fabric Fun Pastel Dye sticks. I sat down this afternoon and I colored in the designs and set them with my iron on high as per their instructions. I’m excited to have the quilt colorful again. It wasn’t made as an heirloom – it was made to put on the floor for babies to look at when on their tummies. Here’s hoping Peter will like it when he comes next week! And the last thing I wanted to tell you is about my food journey. I have to confess, I got really lazy over the past week. I was getting bored with the recipes I had been making and didn’t have the inspiration to go looking for new ones. I kept saying to myself, a little change here or there won’t make a difference… You know, a little sour cream on my taco salad that was supposed to be low fat; or that lunch of banana and peanut butter (can you hear me groan??? I LOVE peanut butter!!!! ); and maybe a bit more sugar free ice cream than I really should be eating. ‘just because it’s sugar free doesn’t mean it’s calorie free’!!! So after 10 days of playing loose and fast with how I was eating, I got on the scales and I gained 1/4 pound. It’s not a lot and I’m not surprised, but it was my wake up call to be more diligent in being creative with my meals. Let’s face it, creative meals take time. A LOT of time! I have to sit down with the computer or the recipe books and actually find something that appeals to me, THEN I have to go through the groceries in the kitchen so I can make a list of what I need, THEN I have to get dressed and go to the store to get what I need, Then bring it home, put it away, pull it out and chop it and baste it and saute it….. And the dishes?!! Geez! I haven’t washed so many dishes since the kids were teenagers! Everything is from scratch and everything takes time. And I can’t begin to tell you how many times I’ve made extra so I would have a ready made lunch the next day to discover that Steve ate an extra portion or took my lunch to work because it looked better than his! I’m off to the kitchen to soften cream cheese, warm up eggs, and make a mess: Taco pie is on the menu for supper tonight and I’ll be making Lemon-Blueberry muffins for this week’s breakfasts and snacks, and I’m making a cheesecake for after dinner deserts. Want to know more about how I am eating? Check it out here: Trim Healthy Mama! 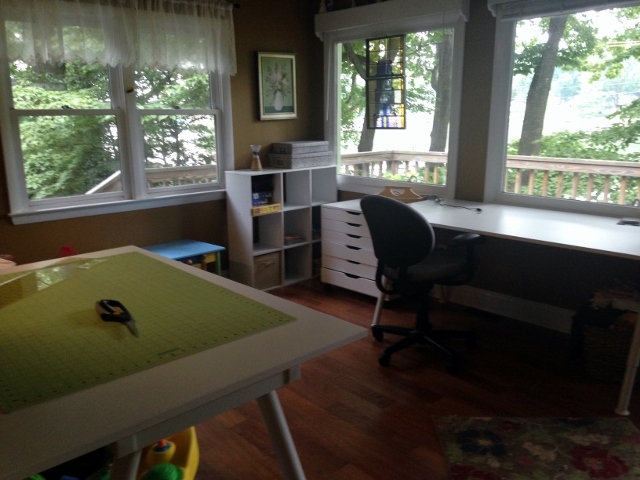 Posted in Uncategorized and tagged eating plan, quilt, studio, trim healthy mama. Bookmark the permalink.